Today I had the distinct pleasure of playing Rustbucket Rumble with Reactor Zero, well, with several of their developers. 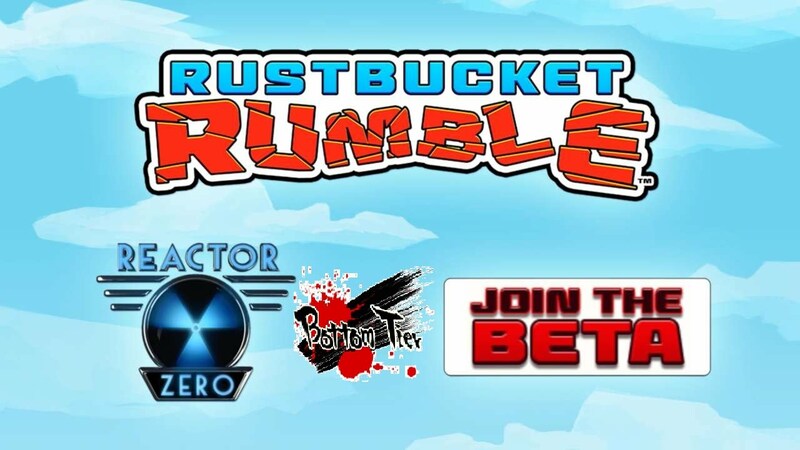 Rustbucket Rumble is a unique 2-D arena fighter, with stages set up similar to Super Smash Brothers or Playstation All-Stars. Lots of platforms, obstacles, ovens filled with fire, and other sorts of things to get in the way of your ultimate goal: Destroying enemy robots, and acquiring recycled parts to create a giant robot! Then it becomes a potential game of Rock’em Sock’em Robots if both teams put theirs together at once! The final victory condition involves getting your bot to the other side to destroy the enemy factory. The roster is small but very specialized. There are six robots available right now, and players will have access to a pair of them to play for free on a rotation. However, there is a bundle you can purchase that will give you all six permanently, not to mention winning ten matches with a robot in ranked will give you access to that robot for the next week as well! I kept wanting to use my mouse to play this, but it is in no way necessary. All of the buttons are usable on the keyboard, though you can attack/grab buckets of parts using the mouse. I’d really like to try playing this with a controller, too! I feel like it has just enough commands/buttons to make it really shine on a console/PC with a controller. Each robot is unique to boot; some of them can definitely work together better than others, but ultimately I found that pretty much every one of the selectable characters could function on their own in a fight, though some better than others! The characters were all awesome in their own way, and have different abilities: Each “grab” ability (which lets them pick up defeated enemies/buckets of recycled parts) is generally different. Kasumi (the Ninja) summons clones that move in different directions to confuse players, while Valencia takes a page out of the Bionic Commando’s book and launches an arm out to grab buckets. And one of my favorites, Bjorn, grabs them before tossing the bucket of parts a great distance! You can create quite the combo to make getting parts to your recycler faster! Speaking of which, when you take down an enemy robot, he is temporarily turned into a bucket of parts, which you will try to run, throw, or transport to your side of the map where the parts will be dumped into the Recycler. Doing so will add points to your robot, and at 100%, they burst free, ready to get violent! To destroy the super robot you have to damage its core, situated on their chest. However if you defeat an enemy near it, the box of parts will hover closer, where he can consume it, and restore HP/gain even more HP. It is also important to note that this gigantic robot ignores the stage, and walks unimpeded to the other side where, if he’s not put to rest, he will begin punching your base until it explodes. I do have to say, that for the most part, it can feel incredibly one sided if an enemy is more cooperative/has better synergy than yours. Getting your super robot alive first offers a game ending advantage in most situations, considering the less coordinated team now has to overcome the same foes that have been beating their buckets all game, with an ultimate megazord at their back. The first match I played with the devs was 2v2 in a custom game, very back and forth. Though regular games will be 5v5, customs can be whatever you please. There are four stages right now, and each one is considerably different in size and structure. But certain robots will be better suited for certain tasks, such as the stage that contains a pathway that has an occasional fiery inferno popping up in it. The only robot that can really run through it is Bjorn with his temporary invulnerability power, which can also definitely be used to tank for your weaker robots should the enemy set up an ambush on the opposite side. It is also important to note that when you scrap a robot, and it becomes a bucket of spare parts, it will slowly regenerate! So you have to be careful and swift, and get it to your base before that timer wears off, otherwise the opponent will get up and try to escape with full health! More than once did I get right to my base, only to watch as they teleported, activated a jetpack, or simply double jumped to safety, out of the range of my bullets. You'll wish the game felt slower when this monster is bearing down on your base. The game is not by any means slow, and certainly reminded me first of Team Fortress 2, which I still stand by. That is by no measure an insult, and it does certainly have similarities. Unique classes, red team vs. blue team, constant action-packed, intense gameplay. One of the things I feel like I should point out (Because I tried it) is when you are behind your own Recycler you regenerate and are invulnerable. However, you cannot kill players from behind it! I spent a good minute trying to fire sniper shots from Valencia, only to learn that it is not possible. I’m very glad to see Reactor Zero took notice of potentially game breaking abilities like that and are on the lookout for more. This was an absolute pleasure to play! It’s intense, fast-paced, but still requires a great deal of teamwork! I cannot wait to see this game go live and enjoy it with the rest of the community. The developers were friendly, and are keeping an eye on what the community wants. I’d look forward to more characters and stages as the game goes on, and do hope that players are watching Rustbucket Rumble. It is my opinion that this game will stand out as a 2D sidescrolling action-oriented arena game. The only thing that I’m not excited about is how the character rotation works. If there are only six available for free, it seems like only having two or so available, and only temporarily having access for winning in ranked! That seems a bit convoluted, but other than that, I definitely enjoyed playing it, and look forward to more. Want to see Rustbucket Rumble in action? Check out our Bottom Tier Report video!